I wasn’t going to post this, but since someone asked, why not. 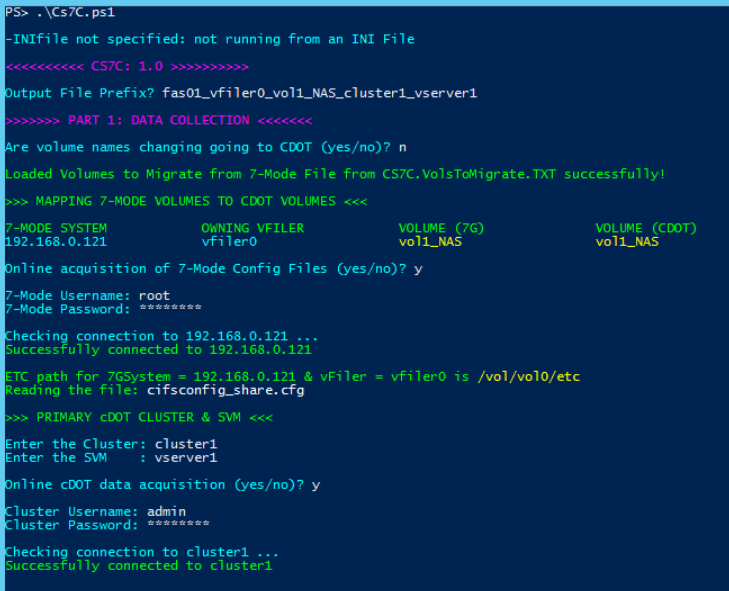 I previously blogged about a bespoke 7 to C migration tool that I wrote called 7CGT. 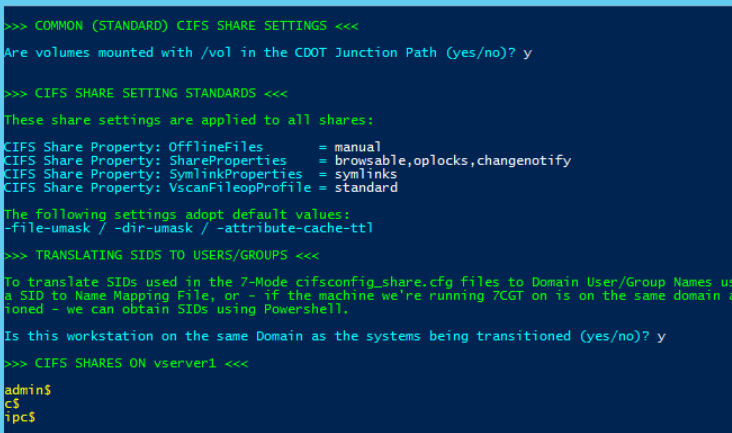 The tool I present here - CS7C (for CIFS Shares 7 to C) - is essentially the original 7CGT just massively cut down with only the bit that translates 7-Mode CIFS shares to C-Mode Clustershell commands. 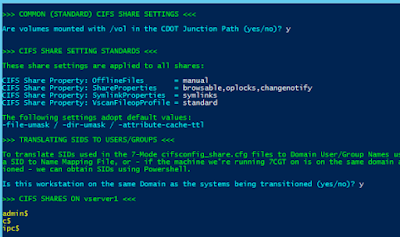 CS7C enables scripted application of the to-be-transitioned shares. It’s easiest to explain how it works with a very simple demo. It works offline and online - I demo the online method since it’s the easiest to demo. The online method is where you have access to 7-Mode and cDOT systems; offline is where you only have access to config files. 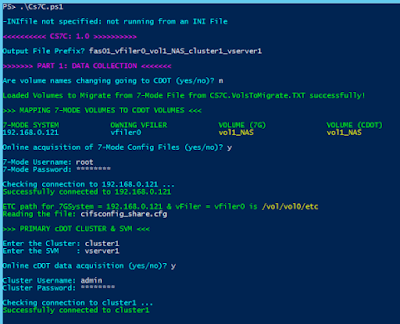 See the images below for screenshots taken from the PowerShell. And below is the output we get. Note: It creates specific VOLNAME$ shares. This may not be something you want but I left it in anyway. # CAVEAT UTILITOR! This tool comes with no support and no warranty, please REVIEW and SANITY CHECK! # '++ WARNING ++' indicates detected conflicts - search the output for these and review. 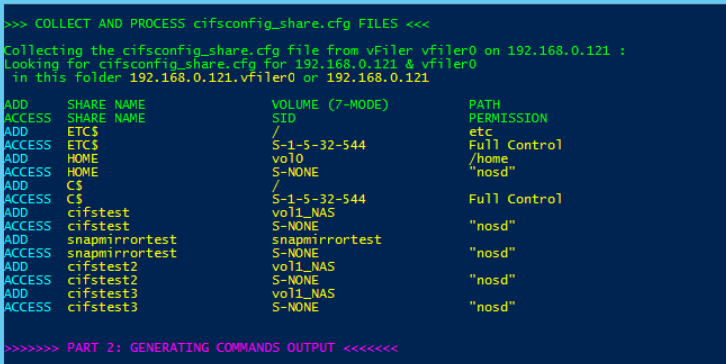 # NB: Transition commands should be generated from the LATEST 7-Mode and CDOT information! # NB2: A CIFS share create automatically gives Everyone Full_control, we do not recreate this! # RECORD THE NUMBER OF ACLS ABOVE FOR LATER USE!